Picture it in your head, teen girl. If you’re anorexic, you’re standing in front of a mirror in your underwear and you see yourself weighing the same that you did when you first stopped eating. But in reality, your body is grossly underweight and your bones are showing! If you are a saved teen girl, truly born-again and you love the Lord, then something is not right. 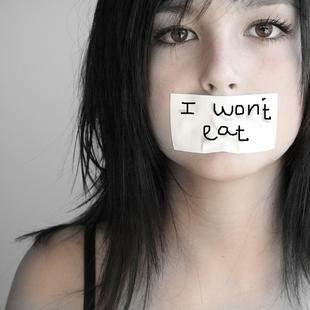 You can get over this eating disorder but you will need to allow God to help you. Jesus Christ died for you! He asks that we glorify Him in our body and spirit. Before you can glorify Him in your body, you must first work on your spirit. This is where reading and studying your Bible comes into the picture – prayer is a big part as well. Memorize Scripture that will comfort you, like Psalm 121:1-2. Know where your help comes from and rely on the Lord to help you! The reason you are where you are right now with this problem is because there is something in this life that you are allowing to control your emotions. Maybe it’s your rebellion toward your parents and not eating is your way of staying in control of your life. Whatever the reason is, the bottom line is that you want control. But the Bible teaches us otherwise. Jesus wants to be in control of your life so that He can help you with your problems. He wants to help and is ready to help – but you must allow Him. He will give you the strength you need to eat healthily. He will give you the strength to let go of the chains that bind you. Applying God’s Word to your life is what will heal you, teen girl. All we need to know is found in your Bible! This does not just apply to anorexia but any other situation in life that “holds” us. Some have issues with drugs or drinking. These same chains that bind them are binding you. It is time for you to allow the Lord to heal you. Matt 11:28-30 Come unto me, all [ye] that labour and are heavy laden, and I will give you rest. 29 Take my yoke upon you, and learn of me; for I am meek and lowly in heart: and ye shall find rest unto your souls. 30 For my yoke [is] easy, and my burden is light.